Using affordable art prints is a great way to promote your work and create a new stream of income into your art business. This week, I bring to you guest blogger of considerable renown. Andrew Darlow is a photographer par excellence, an author and digital imaging consultant. He is also sought after as a lecturer and seminar and workshop leader around the world at photo-related conferences, and for photography organizations. See his extensive and impressive biography at the conclusion of this post. First, I’d like to thank Barney Davey for the opportunity to share my thoughts with you on ArtPrintIssues.com. I’ve learned so much from Barney’s book, How to Profit from the Art Print Market, as well as his writings on this website and others. I greatly value the information and insight he has shared through many artist case studies. In this article, I will cover some specific tips for creating affordable prints that you can start using right away, whether your specialty is painting, photography, sculpture, or just about any other visual or performing art. The word affordable means different things to different people, but in general, I would define affordable as having a retail price from $1-$100. Before I list my suggestions, I think a very short personal history will help set the stage. I’ve been creating and printing my photographic works for more than 25 years. As a child, I would experience the wonder of prints in family albums and the beauty of signed and numbered lithographs on the walls of my home by artists like Michel Delacroix and Edna Hibel. I even started my own personal art collection by filling the walls of my room with unframed posters of red Ferraris and Lamborghinis. My older brother opted for posters of Bruce Springsteen and Tom Seaver, as well as a few outstanding framed serigraphs of the New York Yankees from the late 1970’s World Series. At about age 14, I started taking pictures and would order 3×5- and 4×6- inch photo prints from local photo stores, drugstores, etc. My first foray into darkroom printing was in high school, where I took pictures for my school newspaper and yearbook. In every case, whether output on thin newsprint or bright, glossy pages, I learned the power of the printed image. Since then, I’ve focused heavily on the art of printmaking, including teaching others how to make better prints, licensing my photographs to publishing companies, exhibiting my prints on paper and canvas, self-publishing posters and cards, and creating prints for my portrait photography clients. 1. Distinguish between your “high-end” signed prints and your promotional prints. In general, promotional prints should be inexpensive and easy to produce (only minor handling necessary), and they should not compete with your original artwork. To further distinguish promotional prints from “high-end” prints, I highly recommend clearly showcasing your name and the title of the specific work or series you are showing, as is commonly done in the poster market. I’ve used this approach on multiple occasions, including when I produced an edition of 301 11×14-inch prints of the Chrysler Building. I used it in part to help promote my book, 301 Inkjet Tips and Techniques. 2. Decide whether you want to produce open edition or limited edition promotional prints. This is not an easy decision to make, but in my opinion, affordable promotional prints are generally most successful when they are open editions (not numbered or limited editions). The other advantage of making them open editions is that collectors of your high-end prints will clearly see the difference between your high-end prints and your affordable prints. A specific line on your Certificate of Authenticity indicating that you reserve the right to sell promotional prints of the same image is also a good idea. Disclaimer: I am not a lawyer, and I recommend you consult one (or find out the laws in your state and/or country) if you plan to sell any art. The size and quantities you choose for your promotional prints are important considerations. In the US and Canada, popular sizes include 8×10, 11×14, 16×20 and 18×24 inches. The reason to choose one of these sizes is because affordable frames can be found in any of those sizes, which dramatically reduces the overall cost to the buyer. Creating a series of promotional prints in the same size is also a good idea, as many people like decorating with similar themes and sizes. For example, I created a series of 11×14-inch metal prints made by a company called MagnaChrome during a recent exhibition of my large-scale prints entitled: GRANDmarks – NYC. They were experimental and not for sale during the show, but I plan to make some changes and I may start selling them in the near future for about $85 each. 4. Decide how you are going to have your work printed. There are many ways to create affordable prints, from doing it yourself using a quality inkjet printer, to doing a run of thousands of pieces in which the overall cost is high, but the per-piece cost is very low. Continuous-tone c-prints are also generally affordable if you keep the size of the prints under 12×18 inches. Costco’s photo department is generally a good and affordable option (with the ability to order online and pick up in person), though the paper they use is thinner than most professional color labs. One of the best labs I’ve tested for photo prints is ProDPI in Englewood, CO.
Another option is to use a company that does “short-run” printing to produce promotional prints. Many photo labs now offer the service. I recommend looking for companies who use the HP Indigo or Kodak NexPress printers, as they produce outstanding quality with relatively low minimum orders. Yet another approach is to find a company to handle print fulfillment for you “on-demand.” Some examples include art.com, imagekind.com and redbubble.com. There’s no cost to create an account. You just upload your artwork and start selling. In some cases, you choose your markup, and in other cases, there is a set markup. Though not for the faint at heart, a press run on a large 4 or 6 color offset press can make it possible for you to create thousands of prints relatively inexpensively. By “ganging up” multiple people’s projects on a high-quality heavyweight acid-free paper, you can save considerably on the cost per piece, though it’s always possible that one artist won’t be happy with the results. Now that you know how to create your prints, in Part II of this article, I will cover specific ways to market your prints, both on a “hyper-local” level, as well as on a global scale. 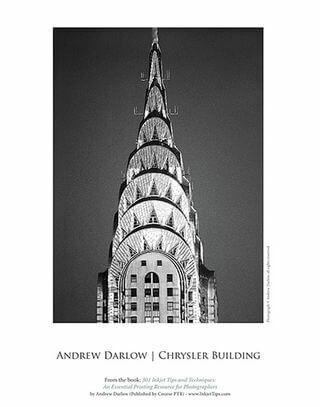 Andrew Darlow is a multi-talented photographer, author and speaker. Some of the prestigious organizations that have tapped into his expertise include the Advertising Photographers of America (APA), The Center for Fine Art Photography, the Arles Photo Festival and the International Center of Photography (ICP). His editorial and fine-art work have been featured in numerous magazines, including Photo District News, PDN Gear Guide, Popular Photography, Professional Photographer, Rangefinder, and Studio Photography magazine. His work has been widely exhibited and his prints are held in many private collections. Darlow is editor of The Imaging Buffet (www.imagingbuffet.com), an online resource with news, reviews, and interviews covering the subjects of photography, printing, and new media. His new book, 301 Inkjet Tips and Techniques: An Essential Printing Resource for Photographers (Course Technology, PTR) was chosen as the winner in the “Photography: Instructional/How-To” category of The National Best Books 2008 Awards, sponsored by USA Book News. For more information, visit the book’s companion site at www.inkjettips.com. His newest book is Pet Photography 101: Tips for Taking Better Photos of Your Dog or Cat (Focal Press). For more information, visit the book’s companion site at www.PhotoPetTips.com, and for 12 free tips from Andrew’s book: 301 Inkjet Tips and Techniques, plus a PDF for selecting the right resolution for printing, visit www.imagingbuffet.com/newsletter.